You can't buy Skyrim yet. But you can buy Skyrim things for a virtual Xbox 360 avatar to wear or stand near. As of today, you can spend $4 on a mage robe or $3 for a dragon prop. There's a bunch more, all ranging from $3-$5, all testing whether your enthusiasm for the big Nov. 11 Elder Scrolls game exceeds that ancient human reflex to not spend a few bucks on dress-up items for a virtual doll. This is a serious internal debate that Skyrim fans must have with themselves. But it could have been funny. This Avatar item sale could have been something other than the serious business it clearly is. 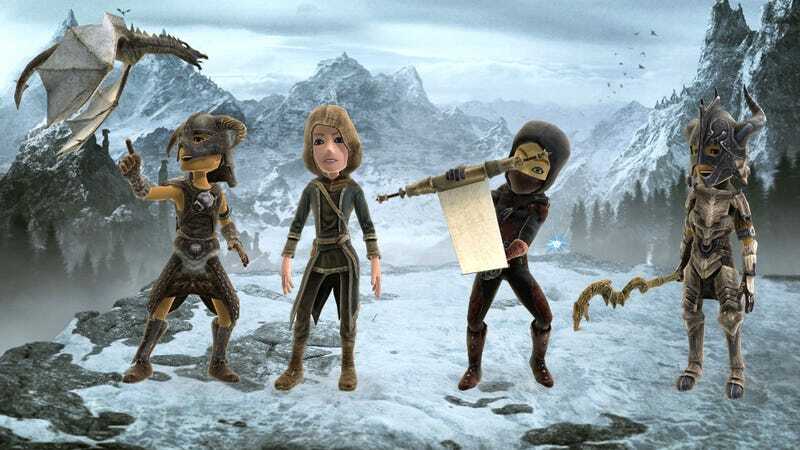 The makers of Skyrim could have charged $4 to give your Avatar something really special, something that many people bought for the previous Elder Scrolls game. They could have started selling the thing that every Avatar needs, that most notorious of $4 pieces of downloadable content, first sold in 2006 for The Elder Scrolls IV:Oblivion: horse armor. Horse armor for your Avatar. A pity that they didn't.